Different kinds of orchids require different conditions to grow well. These exotic beauties derive their moisture and nutrients from tree life in the tropics. This guide is about tropical orchid care. Tropical orchids have a reputation for being delicate and demanding, but home gardeners can grow many of these exotic beauties just as easy as any other houseplant. Unlike terrestrial orchids, which grow in the ground, tropical orchids are primarily epiphytic - meaning they derive moisture and nutrients from the air and rain, and they utilize trees or other structures as growing supports. In the wild, tropical orchids grow on the upper branches of trees at higher, cooler elevations, where there is more available light and excellent drainage. Although these orchids originally hail from warm climates, gardeners in colder regions can still grow them as houseplants. The easiest tropical orchids to grow at home are the cattleyas, epidendrums, lycastes, oncidiums, paphiopedilum (slipper orchids), and phalaenopsis (moth orchids). These orchids rarely grow more than 30 inches tall, and can all be grown successfully at normal room temperatures with moderate humidity (30 to 40 percent). Light: Different types of orchids require different amounts of light, but most prefer as much as they can get - around 12 to 14 hours a day. Place them in any window expect for those with a north-facing exposure. Light should be indirect, to avoid scorching the leaves. Cattleyas, in particular, like a good deal of bright light - enough so that foliage turns yellow-green. In fact, lush green leaves are a signal of insufficient light, which usually results in no flowers. Soil: Tropical orchids will not survive in traditional potting soil. In the wild, they get their nutrients and moisture from the air and rain. When buying tropical orchids as houseplants, they usually come potted up in a special "orchid fiber", which allows the plant's roots plenty of air circulation and good drainage. Orchid fiber usually consists of some combination of fir bark, sphagnum moss, tree-fern fiber (sometimes osmunda), perlite, and charcoal. 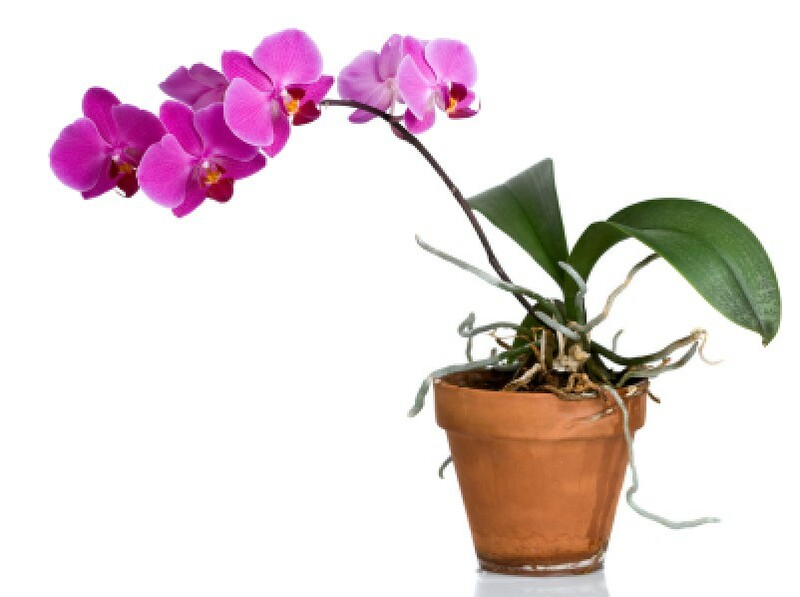 It lasts approximately 2 to 3 years before it breaks down and needs replacing and is usually easy to find at nurseries and garden centers that sell orchids. Water: Most tropical orchids will need watering every 5 to 7 days. Apply room temperature water at the sink, soaking growing medium thoroughly, and letting the excess water drain out. Since the growing medium is porous, the water should run through it very quickly. Because these plants are epiphytic (air plants), you'll want to wait until the surface of the orchid fiber is dry between watering. Never let water stand in pots or the roots will quickly rot. Rotten roots: Healthy orchid roots are usually firm and white, with green tips. Soft brown roots may indicate fertilizer burn, or that the roots have received too much or too little water. They can also be a signal that the orchid fiber has decayed and it's time for repotting. Fertilizer: Use special, water soluble orchid fertilizer and follow the label directions carefully. Orchids can be heavy feeders, and the proper use of fertilizer will result in more robust plants, with longer blooming periods. If in doubt about how much or how often to fertilze, always follow the "less is more" rule. Keep in mind that orchids growing in lower light and drier conditions will not need as much fertilizer. Humidity: Tropical orchids hail from rainforests where humidity is high. Help provide your orchids with humidity by setting the plants on pebbles in a tray of water. Keep the water level below the top of the pebbles, as the roots of most varieties will rot if kept constantly moist. Misting the foliage regularly will also help prevent the orchids from dehydrating. Good air-circulation is very important, but plants should be protected from hot and cold drafts. An open window, ceiling fan (or a small oscillating fan directed away from plants) is a good way to keep the air moving. Repot orchids every 2 to 3 years - when the potting medium breaks down or when the plant becomes overgrown. Wait to do this until after the plant has flowered. Prune off any dead roots with a clean, sterile scissors, and if necessary, divide plants so that each new orchid has three or swollen stems and some new growth. Moth orchids produce offsets and sometimes sprout plantlets on old stems. Remove these when roots grow to 1/2 inch in length, and pot them up individually.